Most of us don’t associate Mercedes-Benz with tiny city cars, at least not in America, and not before a moment of reflection. Oh yeah, we think, Mercedes makes the Smart car. I always forget that. That skill with tiny-car packaging didn’t come from nowhere—Mercedes has been playing with tiny city cars for a long time. And one of the most interesting is their 1982 NAFA concept car, which reminds me of a Kei-class Popemobile. NAFA is the German acronym that means, roughly, short-distance vehicle, which is roughly the same category that today we’d probably call a city car. In 1982 Mercedes-Benz decided they’d like to come up with something designed for short-distance, intra-city travel, and this angular little box is the result. It’s a remarkably clever design, really. Sure, people ended up calling it the “snack trolley,” but listen to all the great features this thing had: four-wheel steering, so that it could probably maneuver just fine inside a shoe store; sliding doors, so it can park almost anywhere, probably even between two parallel-parked cars, front-wheel drive, automatic transmission, A/C, all that; and, perhaps most notably, that plexiglass box that covers the whole back half of the car, sort of like that transparent terrarium they keep the Pope in. The car really doesn’t have many traditional Mercedes styling cues – why wasn’t the tri-star badge stuck in the center of the grille, like on an SL Class, for example? Even so, there’s something oddly appealing about its designed-with-a-ruler rationality. I’d really like to see this thing in person. The interior looks pretty well appointed, or at least those seats look pretty nice. I’m also curious about that rear plexi-cap—it sort of looks like it could be removable, doesn’t it? If removed, that would make this into something like a tiny pickup truck, perfect for hauling some well-secured grandfather clocks and potted trees around town. According to Carstyling.ru, it was concerns over safety that prevented Mercedes from developing the 1982 NAFA concept into a production car. But that doesn’t mean Mercedes gave up; their next city car concept, which can be thought of as the next iteration of this 1982 concept was their 1994 Micro Compact Car (MCC) series. That same MCC acronym was also said to mean Mercedes City Car. These MCC concepts took what was learned from the 1982 car to help inform their design. This time, it was a transverse-rear engine setup, and a basic design concept that’s still recognizable as what eventually became the Smart car. 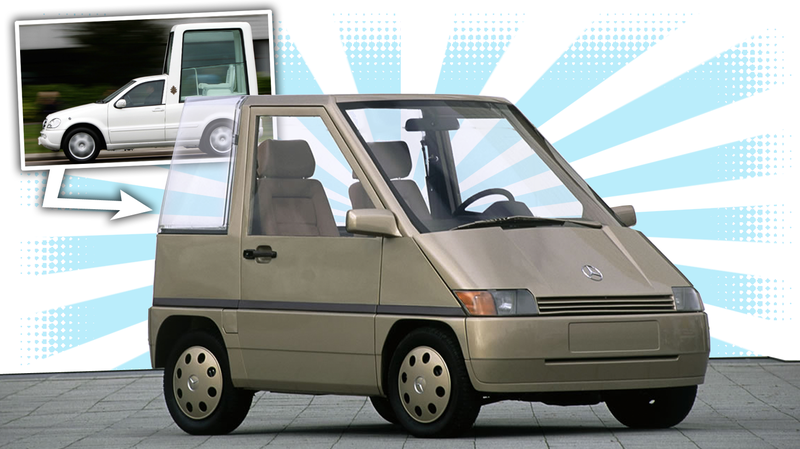 I think there’s still fundamental ideas in the NAFA car that will one day get their chance: an actually successful premium city car, sliding doors (I know Peugeot and Toyota have small car models that did use these), and even four-wheel steering for an urban vehicle. Who knows. If things had gone just a little differently, maybe we’d all be able to buy our own mini-Popemobiles.